In 2004, there were stories circulating suggesting that multiple Tour de France winner Lance Armstrong might go after the legendary World Hour Record of cycling. Given his immense power output and single-minded dedication to training, this seemed like a great idea. And the stories got better: he would do the ride at altitude; he would do it in a specially-built velodrome that would be only used once and then torn down. It would have been a sensation and I, for one, would have paid good money for a ticket to see Big Tex go round and round and round for an hour at insanely high speed. But it did not come to pass. The Hour Record has been a target of many of cycling’s greats–held by Coppi, Anquetil, Merckx, Indurain–but Michael Hutchinson is, in spite of being an excellent rider at the national level, admittedly not one of these. An academic, he came to bike racing very late and thanks to the support of a large bike company was able to turn his passion for cycling into a professional career, albeit one that focused pretty much entirely on time trialling in the United Kingdom. 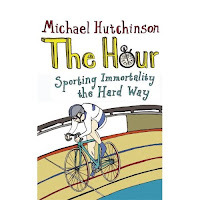 His book is about his attempt to go after the Hour Record at the Manchester Velodrome, a record which he felt was attainable and could be accomplished by the rather modest Team Hutchinson, which seems to have numbered no more than six people. This is a shoestring project but the author puts in an enormous effort to succeed. After recounting the history of the Hour Record, of which the international cycling governing body, the UCI, has, through its bizarre rule changes, reduced the lustre, he writes of his own career and how he wished to go out with some glory. Seizing on the idea of the Hour Record, suggested by a friend, he sets about organizing his training and equipment in a methodical, even obsessive manner, that does not seem to equate with reality very often. It is clear that self-reliance has pitfalls. Pursuing a record at a velodrome is hard enough, but when you need to do it on a bicycle similar to that ridden by Eddy Merckx in 1972 it becomes a serious issue just in terms of acquiring materiel. In an ideal world, Mr. Hutchinson should have been left to focus on his training preparation, rather than chasing around for parts and, in the book’s grimmest chapter, picking up frames from a courier at Heathrow and dragging them home in their gigantic box. Geeky, obsessive and seemingly more terrified of losing than inspired by winning, the author is not so good at dealing with the inevitable setbacks. His description of the war between road racers and time triallists in post-war Britain suggests that there might in fact be a difference between the two tribes. And in the background is the goofy UCI, which decided that it did not like Graham Obree breaking the record in 1994 and decided in 2000 that all the records after Merckx’s effort in 1972 did not count. The post-1972 records became classified as “Best Hour Performance” and the rules now mean that it is unlikely that Chris Boardman’s 1996 distance of 56.375 km can be bettered. The Merckx record has now become the benchmark for “the Athlete’s Hour,” which does not permit any aerodynamic features on bike or rider. Chris Boardman, riding at the Manchester Velodrome in 2000, broke Merckx’s record with a ride of 49.441 km and then ended his career. It was this record that Michael Hutchinson wished to better. The book is certainly quirky, befitting its author, and the climax seems to come with the chapter featuring the Heathrow handover, rather than the record attempt ride itself. Mr. Hutchinson is a gifted athlete who can do a 40 km time trial in 48 minutes but he is often so self-deprecating in the book that he begins to sound like one of those bungling amateurs, a sort of two-wheeled Scott of the Antarctic, so beloved by the British. This conflicts with the impression given by the amount of time he spends training for the attempt and dilutes that story of someone who, with minimal resources but clear talent, wants to accomplish something big. The book, which is primarily of interest to cyclists, is rather basic when talking about training and rather sparse on technical information. And it would have been nice to have some photographs of the principals, including the author’s valiant girlfriend, Louisa. For those of us who open themselves to the challenge of athletic competition and believe it is better to set a high goal and fail than a small one that does not test us, the book could be more inspirational. The Athlete’s Hour has become of little consequence now in the world of pro cycling but it is enjoyable to read about Mr. Hutchinson’s struggle with Mr. Murphy’s Law. Leslie thx for thoughtful review. Yep, frankly I don't get velodrome cycling - in the same way that I don't enjoy heakthclub cycling. I like to get outside and enjoy the scenery. "His description of the war between road racers and time triallists in post-war Britain suggests that there might in fact be a difference between the two tribes. And in the background is the goofy UCI,"